The new AN-S3 (meaning NOT the AN-S3L-AG which is being slowly phased out) and AN-S4 there are now 6 versions of each, 1 Ohm, 4 Ohm, 9 Ohm, 16 Ohm, 36 Ohm and 64 Ohm, the 1 Ohm is for all the Audio Note™ Io cartridges and the rest are for other low output moving coils, such as Dynavector, Denon, Clearaudio, Koetsu, Lyra, Goldbug, van den Hul, Allerts, Ortofon, Goldring and Micro Benz. It is important to appreciate the utmost importance of getting the impedance matching between the cartridge coil and the primary of the transformer as close as possible, we used to sell a transformer, the AN-S7, which had 6 switchable impedances, which was a great help when determining which impedance suited a cartridge best, however, the trade-off in sound quality from the multible taps on the transformers and the switches were too great. 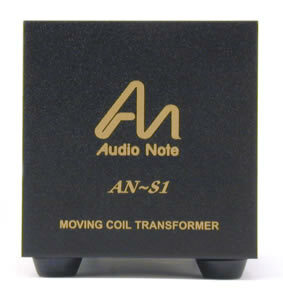 All Audio Note™ MC transformers are housed in solid copper chassiss for best sound. Despite this they are quite sensitive to positioning, and hum will occur when they are too close to power cords, supplies or electric motors and their associated wiring (from a separate turntable power supply to the turntable itself for example), so careful positioning is mandatory.